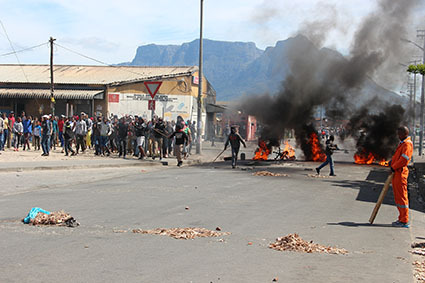 CAPE TOWN – The violence that erupted in Langa, during which at least one person was shot, could have been avoided if residents had been allowed to march to the Civic Centre during the early hours of this morning to voice their dissatisfaction over housing delivery, said a prominent community leader. Following social media messages and isolated protest gatherings that began on Monday evening over lack of housing availability in Langa, and overcrowding of the apartheid-era hostels and council flats in the township, about 2 000 residents had gathered at dawn in order to march to the city centre, only to find the police had blocked the townships’s three exit points, said area committee member and chairperson of Langa Zone 18, Siyabulela Hokisi. Speaking amidst the smell of gunpowder from rubber bullets being fired at retreating groups of protestors, Hokisi said it was at the discovery that their path to town had been blocked that protestors went on the rampage, vandalising metrorail signal equipment and disrupting the train used by hundreds of thousands of commuters daily. Several trains across the city were delayed, with Metrorail regional manager Richard Walker saying it would take a number of days before the train service was back to normal. As a precautionary measure, police closed the N2 for hours, causing traffic chaos throughout the city as motorists had to clog up alternative routes to work. Armoured Nyalas, a water cannon, and dozens of police vans were on the scene by mid-morning as police tried to quell the riot, engaging in running battles with groups of residents until early afternoon. With the township locked down, workers were unable to get to work and all eight schools were empty. During the course of the morning, the Langa Post Office was burnt down, businesses looted and over 30 people arrested for public violence. An emergency meeting was convened between a residents’ task team consisting of various community leaders, police station commander and officials from the mayor’s office, was convened in the police station. Emerging at 12.50pm, Phumelele Nombewu, spokesperson for the Langa housing committee, was the first to address the gathered crowd of over 1 000 people, urging residents to stop the violence. Nombewu said the point was to get the mayor to hear their grievances, and now the mayor’s representatives had come to them. He said mayor Patricia de Lille was in Johannesburg today and it had been arranged that they would meet at 3pm tomorrow, and urged everyone to return to work tomorrow. Loyiso Nkohla, who was a poo-protestor and former ANC councillor who was last week appointed as advisor to the City’s mayco member for utility services, Ernest Sonnenberg, said he was in office to ensure the communities grievances were heard and he was well-aware of the community’s demands before he joined the City. Nkohla guaranteed the meeting with de Lille would take place tomorrow and that people would receive houses. Mayco member for human settlements, Benedicta van Minnen, who was not at the meeting with leaders in Langa, released a statement today condemning the violent protests “in the strongest possible terms”. Van Minnen’s stated the city had had to suspend refuse removal services in the area due to the protest and urged residents to put their wheelie bins away, before the went on to state “the group” leading the protest were demanding further upgrades to the hostels in Langa. But she stated some of the hostels had already been converted into family units and “Phase 1 of the Langa Hostels Community Residential Units” had been completed, with Phase 2 “on its way”. She stated 463 families had beneffited from the city’s “redress programme”, having moved into their new homes in December last year as part of aplan to developo 1 300 residential units in Langa over the next three years. There was a need to transform hostels in other parts of the city but it was not possible to fix all of them at the same time and the need to roll out improvements systematically had been communicated to the leadership from the Langa Zones Hostel. Provincial education department spokesperson Paddy Attwell said it appeared all school in Langa had closed for the day and the seconday senior schools postponed the matric business studies exam they were due to write. “Our circuit team is also monitoring the situation and will work with schools on remedial interventions, as required,” stated Attwell. Reporters: Mphumzi Sizani, Zimbini Molisi, Chandre Appels and Ezra Makhetha.